With thousands of knives flooding the markets, it might seem like there’s so much overlap out there that all knives start to bleed together. If you actually believe that new knives no longer have much to offer, you have a lot of studying to do. Every year manufacturers and designers work hard to bring something new and exciting to the table. To better illustrate how new knives are still proving their worth, we thought it’d be interesting to take a look at all the winners of Blade Magazine‘s “Overall Knife of the Year” award since the start. The winners of this award are voted by attendees of the BLADE Show and a panel of special judges. These knives are typically prototypes at the time, but show real craftsmanship, expert designs, beautiful construction, and much more. The first BLADE Show took place in 1982. From what I could find, the first Overall Knife of the Year award was given to a Fight’n Rooster knife, though I couldn’t pinpoint the model, so I didn’t add it here. Also, the show did not have an Overall Knife of the Year winner in 1983. If I am wrong, please let me know. So with that, let’s start with the knife that won the award in 1984 and work our way to the present. The Survival Hunter is a design by Vaughn Neely, who founded Timberline, and was a beloved knife. You still see these vintage Survival Hunters for sale but they tend to go very quickly. Like I said, these earlier knives are difficult to find information on, but it also won the American Made Design of the Year in 1985. I’m honestly not too familiar with Fight’n Rooster Knives, but I was able to find out that the company was started in the ’70s by Frank Buster. Most of them were traditional slip joint designs typically made in Solingen, Germany. This 7-bladed Congress was all I could find of the knife, but if it’s not the correct model, please let me know. The Buck Titanium was an interesting design with a titanium handle and an overall design reminiscent of the Buck 110 Folding Hunter. It had a monstrous pocket clip, which you can kind of see in the image above. It had a back lock and was just a solid knife. I believe it came back as the Buck 560 Titanium without the clip and with a few changes, but the original was the Buck 186 Titanium. The 186 was discontinued a year later but came back the year after that in the 560. That’s been discontinued too. Here’s more info on BladeForums. The SOG Tomcat is probably a familiar name (it was a Badass Knife of the Week in the past), but they’re currently on the Third Generation. The one that won the Blade Show award in 1988 was the First Gen. When it was first released, it set the standard for large kickback folders and was mighty impressive. Since then, the Tomcat has only gotten better with the Arc-Lock, VG-10 steel, and Kraton handle scales. I couldn’t find much about this traditional design. Blue Grass Cutlery made some Winchester designs if I’m not mistaken. If anyone has any info, please contact me. The Endura is a legend that changed the knife world as we know it. This game-changing model came out the same time as the Delica and has since become one of Spyderco’s iconic models. The original Endura was made with Zytel handle scales and often featured AUS8 steel. The now fourth generation of the Endura features VG-10 steel, multidirectional FRN handle scales, and comes in a ton of variations. The Gerber Multi-Plier is still around in some form. It was pretty interesting to get this as one of the Overall Knife of the Year winners because it was not necessarily only a knife. 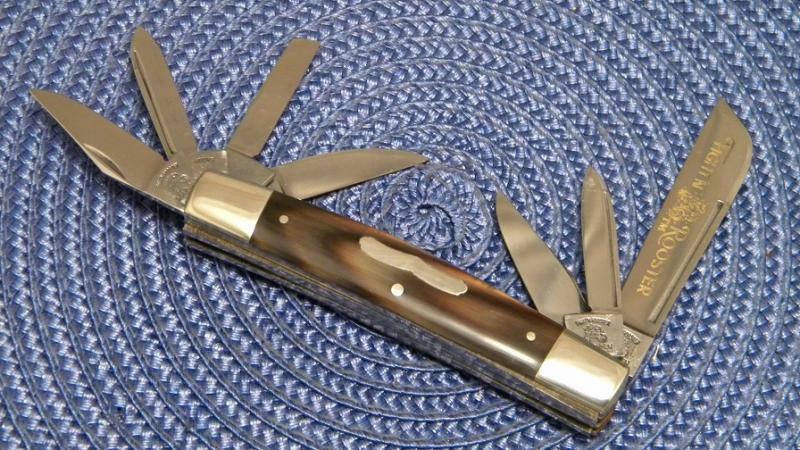 The Buck 180 CrossLock has since evolved into a popular line, but this was the OG. It had two blades in the knife that opened like any other single-bladed folder. When you wanted the straight edge blade, you opened it from one side. When you wanted a gut hook with a blunt point, you opened from the other. If you’ve never heard of the Spyderco Silhouette that’s OK because it was quickly renamed the “Q”. The Spyderco C35 “Q” was renamed because of some copyright issues with the name, but the knife was insane. It had a cutout design in the blade and handle. It came in a ton of color and cutout design variations. Leatherman was dominating the multitool market, but Buck wanted to make its own impression with a plier multitool that was unique. That’s where the BuckTool 360 comes in. Here is an excerpt from the multi-tool.org. Although Leatherman already dominated multi-tool sales, Buck received a years worth of orders for the BuckTool 360 within a few hours of its release. Much of the popularity of the BuckTool is due to the ingenuity of Splane Design, an industrial design and product development company. In order to avoid purchasing rights to use the patented designs of Leatherman, Buck contracted Splane Design to develop a “two axis hinge” multi-tool. The result was a uniquely styled tool that opened by rotating the handles in opposite directions. The Boker Super Liner was a sleek liner-locking folder that was very popular. Its design was well-conceived and was said to fit in the hand perfectly. The Outdoor Edge Kodi-Pak is a kit for hunters that includes pretty much everything a hunter needs to dress, skin, and quarter game in the field. It comes with a leather sheath for easy carry as well. The Emerson Commander was a revolutionary design. 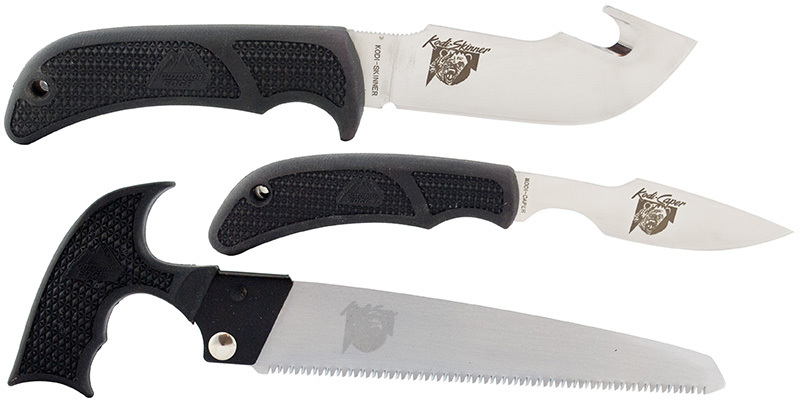 Ernest Emerson set out to create a true tactical knife for those in the line of duty. I believe it was the knife that helped inspire the Wave feature and was the first Emerson knife to have it. The WH S07 is an elegant gentleman’s folder with a frame lock design and wharncliffe blade. The fit and finish was impeccable and the design is downright handsome. The Masters of Defense CQD Mark V ATAC (Advanced Tactical Combat Fighter) is a frightening knife that boasts a nonconducive handle with a built-in pommel and a modified spear point blade made from A2 high carbon steel. The Kershaw Leek was already one of the most beloved knives ever at this point, but when Kershaw decided to add some unique coloration using a new process, it took home the top prize. The recently discontinued Rainbow Leek featured a multi-colored finish that comes from a high-tech process known as Physical Vapor Disposition (PVD). Here is something I wrote earlier: To get the rainbow color, metals were ionized with a high-current, low-voltage arc then placed in a vacuum chamber along with the Leek’s parts. A negative voltage was introduced and a micro-thin layer of metal permanently coated the blade and handle. By introducing titanium oxide and oxygen to the process, PVD is able to create the rainbow coloring you see on the Rainbow Leek. The Westcliff is another sleek and lightweight folder from William Henry. It had a button lock mechanism and handsome flourishes that made it stand out. Remember the Snap Lock? It’s back! When it was first released, the Ed Van Hoy design was breathtaking and pushed the limits of design. You push down the cam stud and swing it open from its side and you do the same thing to disengage. The Offset is a Ken Onion design from Kershaw with a cool spider web type design on the handle. Like most KO knives, it uses the SpeedSafe mechanism and locks with a stud lock, which is similar to the Kershaw Speedbump. The GenTac is a meld between gentleman’s folder and tactical, thanks to its functional and hard-use design that’s also stylish. It has a push button lock, damascus blade, titanium frame with carbon fiber inlays, and sapphire insets. The now discontinued Tyrade featured a composite blade made with D2 steel and 154CM. The titanium handle scales were dressed up with carbon fiber overlays. The CRK Umnumzaan was built with inspiration from the unparalleled Sebenza. It has an inventive design and uses the Ceramic Ball-End Integral lock. It has a large pivot and prides itself on its strength. The Lone Wolf Defender made our list of knives with unique opening mechanisms and uses the Paul Axiel locking mechanism. You can open it by holding the pivot between two fingers and then using force to swing the handle open. The one pictured above is a version from Benchmade, which acquired Lone Wolf Knives in 2010. The Ti-Lock was a collaboration between the ingenious father/son duo of Grant and Gavin Hawk and the great Chris Reeve. The Hawks approached Reeve with a new locking mechanism. The knife takes the lock out of the frame and places it up on the spine of the blade. It’s durable and great to use. Earlier this year, CRK announced that it wasn’t making the knife anymore because of its difficulty to produce and high-concept lock that many people simply didn’t glom onto. The ZT 0777 began the three-year streak of wins at the Blade Show for Zero Tolerance. The knife was one of the most demanding knives the company ever produced due to some issues obtaining materials. It had a composite blade with Damascus and a cutting edge of Vanax 35. In 2012, the ZT 0888 took home the top prize. It was a large folder that was more than nine inches long with a blade of 3.75 inches. The flipper used a composite blade with a CPM-S110V steel cutting edge and 14C28N steel spine. It was a classic titanium frame lock flipper. The ZT 0454 is a design by Dmitry Sinkevitch and has received effusive praise as one of the best knives around. It has an amazing composite blade with a D2 cutting edge and spine and 12C28N middle. The pieces are braised together with copper and look fantastic. The carbon fiber handle is 3d machined with titanium backspacers and a reliable subframe lock. After having a look at the sum of the Hi Jinx’ parts, it’s easy to conclude that CRKT is getting more competitive while widening their scope. This is evident in the materials, price point, designer and OEM choice. Outside of this folder it can also be seen in an increased model diversity that can be attributed to the new designer collaborations they are nurturing. For 2017, CRKT released a budget version of the knife called the Hi Jinx Z. The LionSteel T.R.E. is a titanium frame lock flipper that allows the user to carry the knife with or without the flipper mechanism. IKBS ball-bearing pivot system makes the opening of the knife smooth and quick. The knife is so named because it allows you to carry it in three ways: “a simple basic version without Flipper and pin on the blade, a Thumb Stud version with the pin on the blade or adding the flipper for a quick opening action.” It was well-received by Everyday Commentary. Lionsteel stretched its win-streak to three years thanks to the spectacular SR-11, which evolved from the 2010 innovative knife award winner SR-1. The frame is a single piece of steel worked with 4-axis machining and is smooth as butter. Knives are a matter of preference but it’s hard to ask for a better knife. We’ll see how history views the SR-11. The SURU is designed by the great Jesper Voxnaes and features the first frame lock that uses 90 percent carbon fiber and 10 percent TPI stainless steel. As you can imagine, it’s incredibly lightweight at about 2 ounces. There’s not too much to take away from the Overall Knife of the Year award winners over the past 30+ years, except Zero Tolerance and Kershaw are killing it. The winners for 2019 will be announced at the BLADE Show in June. Let us know if you think we should go back further or show some of the other categories like Most Innovative American Knife or Imported Knife of the Year. I am a knnife lover and was pleased to see your website, especially Knives of the years. Well done and keep it up. Yall aughtta take a look at the “BENCHMADE VOLLI” with S30V stainless. NOW T H A T is a winner! As a tactical knife lover, I find most of these (all except the Chris Reeves) ugly as sin. Of all the working blades that I have used the best knife that I have come back to it the 2005: Kershaw/Onion Offset, why? well after over 24 months of combat duty this knife went with me out side the wire the dust the wind and a many Ft. Drum FTX’s it stayed the same; kept the same edge opened the same. I once cut a sheep from a barbed wire with a M240 covering my back just to save a sheep that was hung up in our wire, the knife is tough it works. Many thanks to Ken onion for a great combat knife. Triple Deuce 11B 01-06 here. What unit were you? wow CRKT/Ed Van Hoy Snap Lock knife design is so attractive. thank you for sharing this information with us..
What would it take to acquire all 15? Or 10? Maybe just the past five years? I’m asking a sincere question. A light weight Collector – – of sorts. Getting all the winners from the past five years will likely set you back about $5,000, considering you’d have to find most of these on the aftermarket. Not only that but many of them are limited. To get them all? I’d guess a small fortune. If you just want one or two, pick up the Rainbow Leek or LionSteel TRE. Those are the only you can get without going through someplace like eBay. Have you found and info on the 1982 Knife of the year? I’ve been looking for 1982 knife of the year for two years and still have no idea what it looks like or how many blades it has. If you ever find the 1982 Knife of the Year Fight’n Rooster information – could you send any info you find. I started collecting the Knife of the year in 2016 and in 2018 got them all, too my satisfaction, but the 1982 Fight’n Rooster. The 1999 and 2000 were the last, and not mint. I only seen one 2006 knife of the Year for sale and bought it, even though the bolsters were dye purple. I’m thinking these awards don’t always bring the right recognition to the table. As I look back on these knives it seems like most, except two or three, have become forgettable over the years, and some aren’t even in production anymore. Where is the spyderco para 2 and Kershaw Emerson collaberations…this list is a joke. 1983 was Timberline’s SA Hollow Handle Survivor. Yep, they won twice in a row. And yes, it was a “Rambo” knife. Awesome! Thanks for sharing. I couldn’t find that info anywhere. I was only able to verify with a single line on Gil Hibben’s site, but I think that’s good enough for me. I’ll update this post soon. Any idea about which Fight’N Rooster knife won in 1982? This list was awarded by BladeShow…they are not KnifeDepots choices. All you guys saying “this list is crap because you didnt include my favorite knife!” are stupid. The knives were chosen because there was something innovative about them…I think they all qualify.